A media room is meant for activities such as entertaining, hanging out, watching TV, or listening to music without disrupting the rest of the home. However, this isn’t always the case when the sound of sirens from that racing video game or screams over this week’s big football match-up find their way around the house. 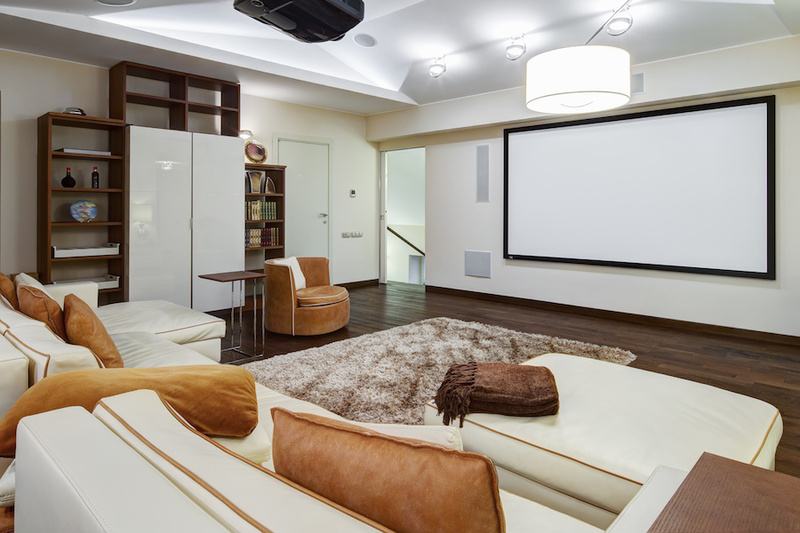 If your spouse, kids, or house guests are tired of hearing the loud noises coming from your media room, check out these products for soundproofing your entertainment space quickly and easily. Is most of the noise from your media room exiting through the walls? Home media centers are often wood-framed, meaning that the wall soundproofing performance is worse than their commercial counterparts. Even with “sound batt” in the wall (read: fiberglass batting), the wall will generally not block an acceptable amount of noise to allow loud performance or media on the inside of the room. If this is the case, consider using a product such as Mass Loaded Vinyl behind the drywall, or add it on to the existing drywall, in order to increase the STC of the partition. If you are pre-construction, your best bet is to staggered the wall studs, so that no stud touches both sides of drywall. This can easily gain you 10-12 points! Our AcoustiDoor™ can be hung over the doorway into your media room to keep noise from seeping into the rest of the house. Hand-crafted, customizable to your door size, and available in a variety of colors and fabrics, this is a visually appealing, low-cost solution to noise problems. Door seals (placed around the perimeter of the door) or sweeps (placed underneath the door) are other options available to keep noise from traveling under doors. While STC-rated doors in the 35-40 STC range may cost $1500-$5000 each, a Soundproofing Door Panel may cost only $200-$300. Is your media room in the basement? Our Ceiling Blocker Pro can be installed between an already existing ceiling and additional layer of drywall. This will reduce noise from traveling up into the other floors of the house. Treating the ceiling is generally recommended if the sound is coming from below, while treating the floor is most effective if the sound is coming from above. Applied over existing walls, acoustical wallpaper can reduce up to 75% of noise and be installed by the typical DIY’er. It also has the ability to be primed and painted over to match any decor in your media room, meaning no construction or remodeling. Check out our OverWall Noise Blocker, an easy fix for the common problem of noise disturbances! Note that acoustical wallpaper, like acoustical paint, varies in effectiveness depending on the stud size and spacing, along with other factors. This entry was posted in Soundproofing and tagged acoustical wallpaper, Acoustidoor, entertainment, media room, Soundproofing.